Native Ohioan Don Carlos Buell was a Union general during the American Civil War who directed the Department of the Ohio and commanded the Army of the Ohio in the Western Theater. Buell's army helped turn the tide to a Union victory at the Battle of Shiloh (April 6-7, 1862). Don Carlos Buell was born on the farm of his grandfather, Judge Salmon Buell, in Lowell, Ohio, on March 23, 1818. Named after his uncle, who was a lawyer in Ithaca, New York, Buell was the son of Salmon D. Buell and Eliza Buell. Buell's father died during a cholera epidemic in 1823, when Buell was five years of age. In 1826, Buell was sent to live with an uncle, who was a prominent farmer and merchant, in Lawrenceburg, Indiana. There, he was educated at a local private school, before receiving an appointment to the United States Military Academy in 1837. Buell graduated from West Point in 1841, ranked thirty-second in his class of fifty-two. Buell was commissioned as a second lieutenant in the United States Army on July 1, 1841. He fought in the Second Seminole War and the Mexican-American War, where he was brevetted three times and wounded at the Battle of Churubusco (August 20, 1847). After the Mexican-American War, Buell served in the army's Adjutant General's office and climbed steadily in rank. At the outset of the American Civil War, he was on the West Coast serving as the adjutant general of the Department of the Pacific. Buell was quickly recalled to Washington, where he helped his friend, George B. McClellan, organize the Army of the Potomac, briefly commanding one of its divisions. Buell was promoted to lieutenant colonel on May 11, 1861, and to brigadier general of volunteers on May 17, 1861. During October 1861, McClellan set about reorganizing the Union forces in the West. On November 15, McClellan appointed Buell to command the Department of the Ohio. All of the forces within the department were then consolidated to form the Army of the Ohio, with Buell in command. Buell was directed to organize a campaign to liberate Union loyalists in East Tennessee, but he basically ignored his orders. Instead, he moved against Tennessee’s capital at Nashville. Buell easily captured Nashville on February 25, 1862, because the Confederates were occupied elsewhere with Ulysses S. Grant's assaults on Fort Henry and Fort Donelson. 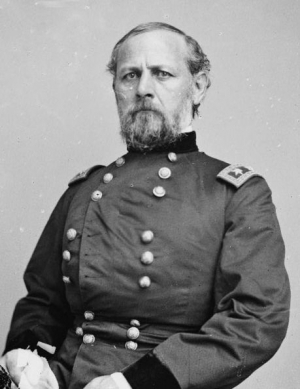 On March 21, 1862, Buell was promoted to major general of volunteers, but he lost his independent departmental command. He and Major General Henry Halleck, who commanded the Department of the Missouri, were unable to coordinate Federal operations in the West. At Halleck's urging, the Lincoln administration merged the Departments of the Ohio and the Missouri to form the Department of the Mississippi under Halleck's command. Buell still commanded the Army of the Ohio, but thereafter, he reported to Halleck. Halleck ordered Buell to leave Nashville and move southwest to support Grant's operations along the Tennessee River. Buell's army left Nashville on March 13, 1862, and arrived at Pittsburg Landing on the evening of April 6, to the sounds of the Battle of Shiloh (April 6-7, 1862). Confederate generals Albert Sidney Johnston and P.G.T Beauregard launched a surprise attack against Grant's army encamped at Pittsburg Landing early in the morning of April 6. The unprepared Federals were driven back and in danger of being overrun at the end of the day. Confident of a Rebel victory the next day, Beauregard halted the assault at nightfall and telegraphed Confederate President Jefferson Davis, proclaiming "a complete victory." During the night, however, Buell's army arrived on the scene. Bolstered by fresh reinforcements, Grant launched a counterattack the next day, forcing the Rebels to retreat and eventually withdraw their army to Corinth, Mississippi. After Shiloh, Buell assisted Halleck in the Siege of Corinth (April 29 - May 30, 1862). On July 23, 1862, the Lincoln administration summoned Halleck to Washington, promoting him to general-in-chief of all Union armies. Grant replaced Halleck as commander of most of the Federal forces in the West. Buell's Army of the Ohio, however, was separated from Grant's command, and Buell reported directly to Halleck. On June 10, 1862, Halleck ordered Buell to advance on the important railroad hub at Chattanooga, Tennessee. Three weeks later, after Buell had advanced only 90 miles, Halleck warned Buell that "The President says your progress is not satisfactory and you should move more rapidly." Buell's lethargy proved costly. Before he could launch the planned assault, Confederate General Braxton Bragg used railroads and ships to execute a flanking movement of over 700 miles and beat Buell to Chattanooga. With the intended prize no longer attainable, Buell settled for re-occupying Nashville. In late August 1862, Braxton Bragg launched his Heartland Campaign to capture the Border State of Kentucky. On September 17, he seized an important rail station along with 4,000 Union soldiers at the Battle of Munford (September 14-17, 1862). Buell now found himself in the alarming position of having Bragg's army between the Army of the Ohio and the vital Union supply center at Louisville, Kentucky. With his supply lines threatened, Buell made a hasty withdrawal around Bragg's army back to Louisville. After Buell returned to Louisville, President Lincoln relieved him of his command on September 30, 1862, replacing him with Major General George Thomas. Thomas, however, refused the command, and Lincoln reinstated Buell the next day. With a renewed sense of urgency, Buell reinforced his army with recruits from Indiana and set off in pursuit of Bragg. Buell sent a small diversionary force toward the Kentucky capital at Frankfort, where Bragg was attending the inauguration of Richard Hawes as the provisional Confederate governor of the commonwealth. Concurrently, Buell sent the bulk of his army southwest toward Harrodsburg in search of Bragg's main army. On October 8, 1862, part of Buell's army engaged most of Bragg's army at the Battle of Perryville. The battle went well for the Confederates initially. Facing stubborn resistance, the Rebels gradually drove the Federals back nearly one mile. As the day progressed, however, more of Buell's army arrived on the scene. Running short of supplies and ammunition and faced with the prospect of squaring off with the bulk of Buell's army on the following day, Bragg withdrew during the night, despite suffering fewer casualties and achieving a tactical victory at Perryville. After the Battle of Perryville (October 8, 1862), Bragg retreated to Harrodsburg, Kentucky where he joined forces with Lieutenant General Kirby Smith. The combined Confederate army was now comparable in size to Buell's army. Nevertheless, Bragg lost his enthusiasm for the campaign. Over the objections of Smith and his subordinates, Bragg called off the offensive and evacuated Kentucky. Buell failed to pursue the retreating Confederates, claiming that he lacked the necessary supplies. On October 24, 1862, President Lincoln relieved Buell from his command because of his inaction. Buell was ordered to appear before a commission investigating his leadership during the campaign. The commission met from November 24, 1862 to May 10, 1863, but it never issued a final report. From May 10, 1863 through June 1, 1864, Buell's official status was "awaiting orders." Buell was offered new battlefield commands, but he refused to serve under officers that he once outranked. With his military reputation irreparably damaged, Buell was mustered out of volunteer service on May 23, 1864 and he resigned from the military on June 1. In 1864, Buell supported George McClellan's Democratic Party bid for the Presidency and openly attacked the Union leadership for how it was waging the war. After the war ended, Buell served as president of Green River, Kentucky, Iron Works from 1865 to 1870, and he later engaged in other mining activities. From 1885 to 1889, Buell served as a U. S. Pension Agent at Louisville. Buell was also a member of the first board of trustees of the Kentucky Agricultural and Mechanical College (now the University of Kentucky). Don Carlos Buell died on November 19, 1898, at Rockport, Kentucky. He is buried at Bellefontaine Cemetery in St. Louis, Missouri.